The poignant and rather touching tribute to the late Baroness Thatcher in this week`s Walsall Advertiser from, of all people, Councillor Pete Smith reminds me of my own encounter with the former Prime Minister. The circumstances that led to me driving towards St James`s Park (the one in London, not the one on Tyneside) at six thirty on a spring morning in 1988 are too complex to describe in detail. Suffice to say that it involved a friend who worked for a television news company, a Ford Fiesta that refused to start, my reliable if battered Mini and a government photo opportunity. I pulled over at the end of The Mall near Admiralty Arch to let her out and find her camera crew then went on to find somewhere to park. By the time I joined her at the Horse Guards end of the park, a host of photographers and camera crews stood around looking bored and opening flasks of coffee. That was about to change. Nigel started looking in the bushes much to the amusement of the waiting photographers. Then, striding across the grass came the colossal figure of Nicholas Ridley, the then Secretary of State for the Environment. It could be that he was suffering from some illness or that he might not be a morning person, but given the ungodly hour, the minister appeared to be drunk. Surveying the scene, he lit a cigarette and turned the air blue with some very unparliamentary language. Spad panic ensued and two ran off in the direction of Great George Street and the others started screwing up papers from their clipboards and throwing them on the ground. The press, now openly guffawing, joined in by screwing up their briefing notes and throwing them at the Spads. Ridley contributed by flicking his cigarette end at the laughing snappers and sparking up another fag. By now, battle-hardened camera crews and veteran political hacks had to hold each other up such was intensity of helpless, hysterical laughter. Ridley flicked another fag end at them and left followed by the gaggle of chinless wonders desperate not to be deployed as an election agent in a constituency in the South Yorkshire coalfield. The camera crews packed up and the photographers talked of a pub in Fleet Street that was open very early. The small, slightly aged bin man picked up the litter deposited by the Spads and threw it into the back of his trailer. Clearly, this memoir cannot be compared with Councillor Smith`s “one-to-one conversation” with the Prime Minister which was, it seems, “quiet, pleasant and interesting” but I hope it is as illuminating even if there is no mention of meeting Indira Gandhi. Mrs Thatcher tended to employ some truly dreadful speech writers. 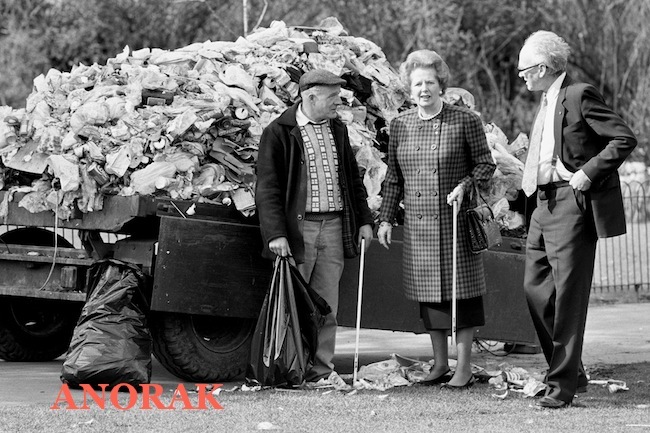 In an attempt to make her seem amusing and endearing, they came up with “Bag it, bin it, together we`ll win it” as part of her campaign against litter. The unbroadcast footage of the rubbish pantomime was streets ahead in terms of amusement than a weak and meaningless sound bite. Councillor Smith reminds us that at the time of his meeting with Mrs T, he was a member of the Labour Party. It is interesting then, that he should sign his letter as a member of Democratic Labour, even though he stood and was elected as an Independent councillor representing Blakenall ward. Thatcher`s speech writers also gave us the hilariously unfunny “you turn if you want to; the lady`s not for turning.” Councillor Smith, whatever party or not a party his letter represents, seems to prefer Margaret Thatcher rather to Tony Blair because she stuck to her guns. No wonder the left is unelectable. A very intriguing piece/memoir. In my personal opinion the left has demonized Thatcher beyond any fairness. I am not of that generation, yet it is apparent to me that, somehow, anything that is pernicious or authoritarian is described as a Thacherite thing, or rather a Thatcherism. Whatever the case, although Thatcher was not a perfect prime minster, it is extremely unfair in the manner in which she is represented today.